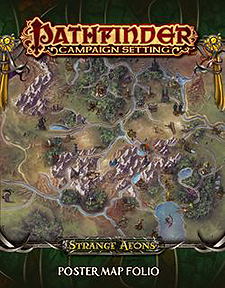 See the eerie and eldritch sights of the Strange Aeons Adventure Path with the Strange Aeons Poster Map Folio! Gaze upon alien and otherworldly vistas, explore creepy countrysides, and plot the course of your unsettling adventures. These three huge, lavishly illustrated poster maps display locations found in the Strange Aeons Adventure Path. Thrushmoor, the town where one of the adventures is set, comes to life in the first map, while the second map depicts an ancient alien city in a remote, blasted desert. The final map is a pictorial and informative map of horror-filled Ustalav, complete with sketches of some of the denizens and dangers of that haunted land. Whether you need a fog-shrouded town, foreboding ruins, or a gorgeous player handout, these beautiful maps are the perfect resources for the Strange Aeons Adventure Path or any fantasy campaign.